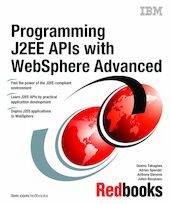 This IBM Redbooks publication has examples of programming the new J2EE APIs using VisualAge for Java and deployment on WebSphere Advanced. Part 1 introduces J2EE and the PiggyBank application scenario, which is an integrated application used to illustrate various principles and techniques for enterprise software development. In Part 2, learn the depth of EJB container of the J2EE specification, which includes transactional EJBs, transactions, messaging with JMS, WebSphere and MQSeries. In Part 3, learn the latest servlet and JSP specification with Web application concepts.